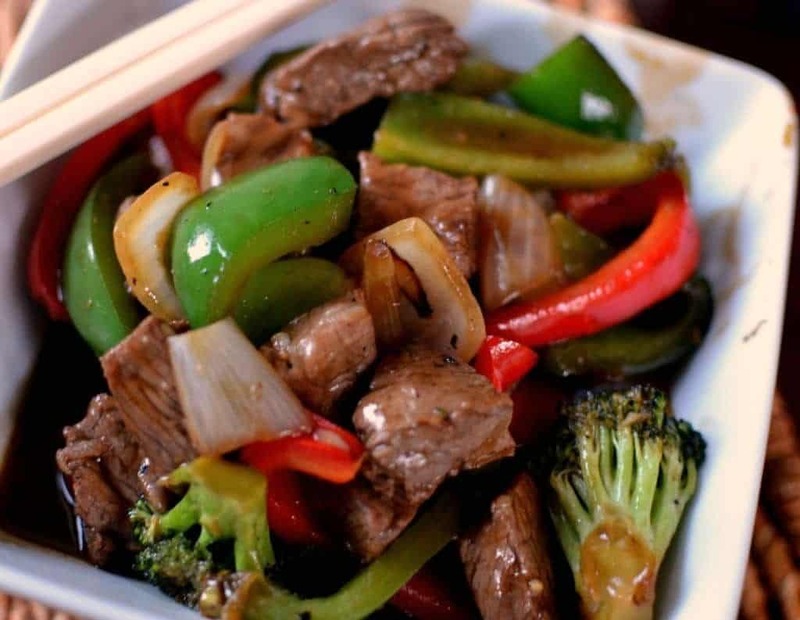 Spicy Beef Pepper Stir Fry is a healthy dinner choice full of red and green bell peppers, broccoli, onions and steak in a slightly spicy ginger garlic soy sauce. I love stir-fry. Weekends are the perfect time to prepare stir fry. 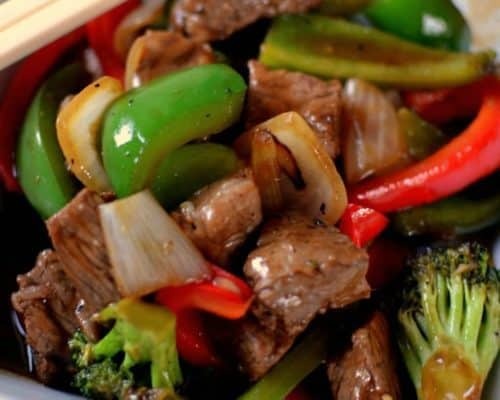 This Spicy Beef Pepper Stir Fry also referred to as pepper beef stir fry is an easy recipe with just the right amount of spice. With a little practice anyone can make perfect stir fry at home. The key to excellent stir fry is heat. The oil should be almost to smoking point when you add the meat and veggies. Canola, peanut and vegetable oil are all good choices because they have a high smoke point. The key to good stir fry is high heat for short periods of time making your vegetables crisp tender. I cook my stir fry in at least three batches meat, veggies and sauce. I cook it in four batches if I have a large amount of veggies. You never want to crowd the wok or skillet. We love stir fry! It is really not that time consuming if you prep and cut your veggies ahead of time. In fact the time in front of the wok is very brief and goes quite quickly. That wok will need your full attention for a few minutes. Here are some more excellent stir fry recipes! Other stir fry dishes you will love. 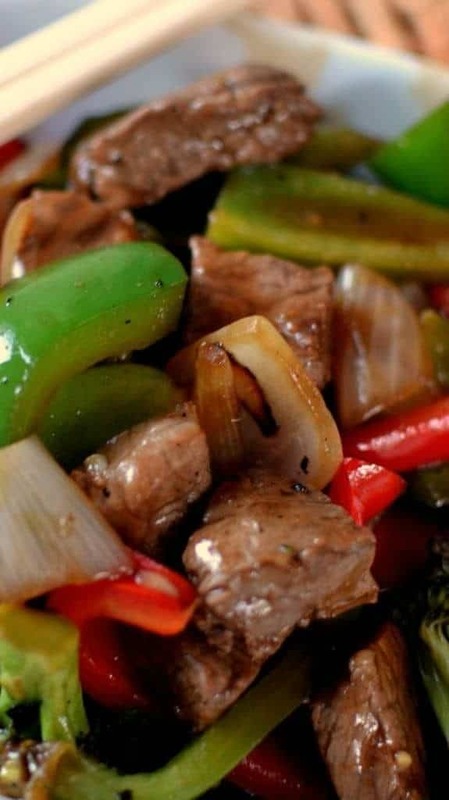 Just to recap on some helpful hints to make this Spicy Beef Pepper Stir Fry magnificent! This scrumptious Spicy Beef Pepper Stir Fry is so easy to make at home, tastes so much better and costs less than take out. All you really need is the ability to work your chop sticks well! This post was originally published July 24, 2014 and was republished June 14, 2018 with new relevant information and helpful hints. 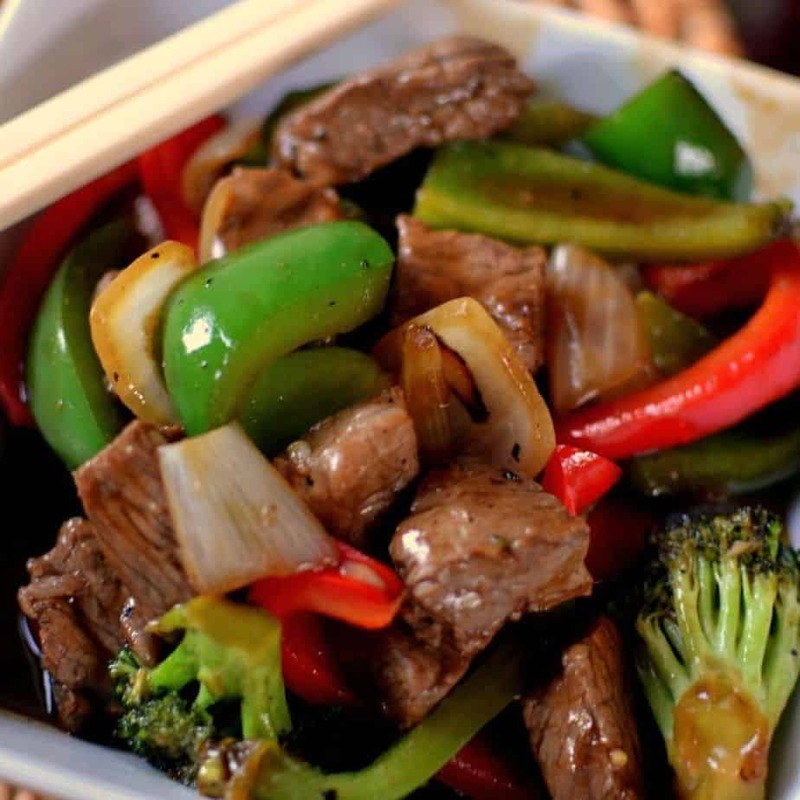 Spicy Beef Pepper Stir Fry is a healthy dinner choice full of red and green bell peppers, broccoli, onions and steak in a ginger garlic soy sauce. 1 lb strip steak trimmed and cut in bite size pieces. Combine soy sauce, water, mirin, Worcestershire sauce, ginger, garlic powder and cornstarch in a medium ceramic bowl. Mix with whisk. Pour half of the mixture into a large Ziploc bag and add beef strips and allow to marinade for 30-90 minutes. Refrigerate while marinating. Heat wok with 1 – 2 tablespoons canola oil until smoking. Your wok should be very hot. Swirl to coat the wok. Shake the beef in the marinade to get the cornstarch mixed again. Remove the beef from the marinade and carefully add to the wok. Discard the marinade. Cook for about 3-4 minutes stirring halfway through. Remove the steak, cover and keep warm. Add another tablespoon of canola oil over high heat. Swirl again to coat the wok. Add the broccoli and cook for about 1-2 minutes stirring once. Add the peppers and onions and cook for 2-3 minutes stirring once or twice. Reduce heat to low and add the garlic and cook for 30 seconds.. Remove all veggies from wok, cover and keep warm. Add the sriracha 1/2 teaspoon at a time and taste. Everyone’s heat tolerance is different. At the request of readers I have modified this recipe to split the marinade. The half that is soaked with the meat is discarded and the other half is cooked with the meat and veggies at the end. Looks good will have to give it a try. Thanks. I love stir fry! I tried this and it was Great!!! My son ate it so that means it was good. Will be making again for sure!!! So glad you liked it. I love the compliments. It keeps me cooking! Yes ! Made this tonight, I had just bought siracha and was the first time I’d used it !! Very Good !! Thanks so much! I am so glad that you liked it!! Looks delicious! I need to know what mirin is and sirs ha also! Mirin is sweetened sake and sriracha is hot chili sauce. Both are available in local grocery stores in the Asian food section. Happy cooking! Is mirin a spice in a container ??? Is Mirin in spice area?? & comes in its own container??? Mirin is sweetened sake and if available would be in the Asian section of your grocery. It is liquid. If unavailable substitute 3/4 teaspoon sugar mixed with 2 tablespoons of sherry. My apologies. I thought I responded to this a long time ago. Mirin is sweetened sake and can be found in the Asian section of quality grocery stores. It is in liquid form. I can’t wait to make this. I don’t have a wok so I’ll use a lg skillet. Also do you have a recipe for hot and sour soup? Thank you for your recipes. No I sure don’t but I sure do love hot & sour soup. That is a great thing to add to my list!! Thanks! It is delicious! How did you like it? Made this last night, Delicious!! Thanks Linda! So glad that you liked it!! I made this tonight. It was delicious. I doubled the recipe. I think by doing that it was a little too salty. Any recommendations for next time if I use less soy sauce? I did use low sodium soy. I think it’s because I had to make double the recipe. It was still very delicious. Thanks. Glad that you enjoyed it. If it was too salty for your taste I think that I would cut back on the low sodium soy sauce and replace the difference with water. Maybe 1/3 cup low sodium soy sauce and 2/3 cup water. Happy cooking! Picture looked delicious! I had to try. It came out fabulous. I added jalapeños because we like it spicy. Thanks for the new recipe. Glad it turned out great. Have you checked out my Jalapeno Popper Grilled Cheese ? I have several. Are you looking for the grilled cheese? It is delish. Let me know what you think!!! Happy Cooking!! Yum! I loved this sauce- I hate buying pre-made sauces because they always have gross ingredients, but I also usually can’t re-create the yumminess! This sauce was delicious, as was the whole meal! Yes pre-made sauces are gross. Glad you liked it. Sorry about the delay in responding. It seems all of my comments are not showing up in my email!! How much canola and sesame oil? I see the recipe says 1 but I didn’t see the measurement with it. Thanks! 2 tablespoons sesame oil and 1 tablespoon canola oil. You might need a tidbit more if things start sticking!! I added more steak and more Sriracha because we like it more spicy. I personally don’t like the taste of Sriracha too much, but putting it in this dish made it taste different. It was very yummy and I think it paired nicely with quinoa. Thank you very much! Very easy to make an we definitely enjoyed! This was sooooooo amazing! I accidentally added 3 TBSP corn starch (extra calories…but still wonderful!) and I added a jalapeno to the veggies. We also added sriracha to our individual serving to make it as hot as we preferred. Thanks for sharing this- I think we will make this one often! Could this be done in a cast iron Dutch oven? It could but the result will be different. You might be able to get the dutch oven hot enough to quickly cook the food. I am sure that you know the object behind stir frying is to cook your veggies crisp tender. Try it and let me know. I love my dutch oven. I have several wonderful recipes out here that go in the dutch oven. One is my Chinese Five Spice Ribs and the other is my Pulled Pork & Slaw Sliders Yummo! This will be one of my go to recipes. Made this for dinner. We both loved it . Thank you so much. Is it ok to marinade the meat longer? I’d like to leave it till about 5 but don’t know if it will ruin the meat sitting in the marinade for hrs. Oh gosh I am so sorry I just saw this. I think it should have been fine. How did it turn out? Sorry again! Small teenager crisis! This turned out awesome. Thanks it will be a regular item on our menu. That is great. So glad that you liked it!! This was fabulous! This will definitely be a regular on my menu! Thank you! Thank you so much! I am glad you enjoyed it!! Thanks so much! Go to have you aboard! Do you really use 3-4 teaspoons sriracha, I tried 2 and was way to spicy for me, blisters on the lips. Should it have been 3/4 teaspoon? Sorry to hear about your blisters. Yes I really do. I have had people tell me it is not hot enough. I guess everyone has a different heat tolerance. I am going to put a note on the recipe right now. Thanks for the heads up! iam living in U.K and i don tknow what is mirin and sriracha? where can i buy them? Good morning. Sorry about the delay. The kids have been ill and things are just really crazy right now. Mirin is sweetened sake and I find it the Asian section of my grocery. It is not a key ingredient if you can not find it. Sriracha is hot chili sauce also found in the Asian section of my grocery. You may have a different type of hot chili sauce that would work. I love it too although I have never tried it in my beer!! I made this dish today, it’s delicious! I timed everything as directed, the vegetables still had a slight crunch, not over cooked. The meat is very tender as I used flank. I avoided the sriracha as i’m cooking for the elderly. Served over a bed of steamed rice! I would definitely make this dish again! Awesome! I am so glad that you liked it! Thanks for leaving such a sweet note! I love that stir fry as well. I have made many stir fry’s and this is the best one yet! So often sauces are too sweet, not this one and it had the perfect amount of heat. I used dry sherry as I didn’t have mirin, but I have since bought some and will be making this again, thank you! Thanks so much Felicia. It is very kind of you to leave such a sweet comment. I like that recipe too. I hope you enjoy cooking with Mirin. I like to add just a touch of it to a lot of my Asian dishes. Not on that one. The salt in the soy sauce will start to chemically cook the meat. We love this recipe so much! Having a few friends over and want to make it. Do you think it can be made in a crockpot? Thanks so much! Sorry but I think this is one recipe that would not work well in a crock pot. Thanks Mark! I am glad that you liked it! I cannot wait to try this, spicy stir-fry is my favorite thing to eat. After looking a lot of other stir-fry recipes, yours looked the most appealing to me by far. So happy to have found you and can’t wait to try this as well as other recipes! Thanks so much Scotty! I really enjoy stir fry too. It is one of our favorite things to eat as well. I sure hope you enjoy it and I look forward to hearing from you!